Retailers selling jewelry and luxury watches have historically been slow to move to online sales. The idea of selling time-honored, elegant luxury pieces on the chaotic, instant-gratification-delivering internet just seemed a bit off. And frankly, consumers looking to buy a very personal and very expensive item were less than enthusiastic about carrying out that experience in the digital netherworld. Like so much in retail, all that has changed. Online sales of jewelry and luxury watches are on fire, according to “Risk & Reward: The Jewelry Industry’s Digital Transformation, Signifyd’s in-depth look at the retail jewelry and luxury watch industry. As consumers become more comfortable buying very personal and very expensive watches and pieces of jewelry online, the industry is embracing ecommerce like never before. 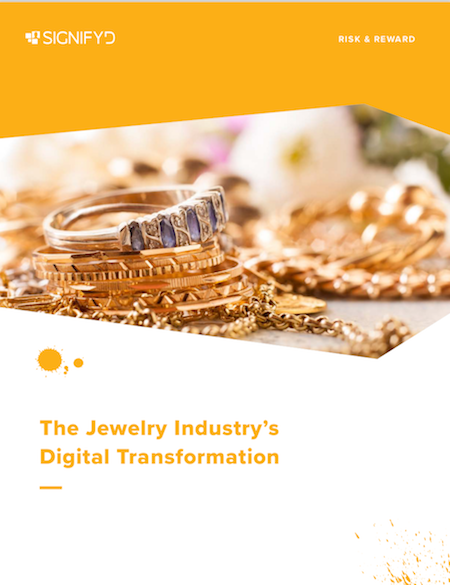 Download Signifyd’s “Risk & Reward: The Jewelry Industry’s Digital Transformation to learn more about the trends in the industry. “There is no doubt in my mind that 65 percent of watches in the next three years will be delivered online,” the report quotes Andrew Block, a jewelry and watch seller, telling the Robb Report. The online surge is being accompanied by consolidation in the industry and the rise of brands selling directly to consumers, the Risk & Rewards report notes. The trend has been underway for years, with 911 jewelers closing their doors in 2015. The remaining players are getting bigger. Millennials are also driving changes in jewelry and watches, the way they have across the retail world. The influential generation has a relationship with jewelry that is different from the one their parents had — and the Signifyd report explains that in some detail. And whatever you might guess, millennials are not forsaking luxury watches for smart watches, when you look at the global picture. Turn to the report to see just how that is playing out internationally. And, of course, as the world of selling jewelry and luxury watches is changing, so is the world of fraudsters that come after what are literally the shiny objects of the retail game. Those seeking to digitally pilfer bling and fancy watches have turned in a big way to account takeover fraud, according to the report. In fact, citing figures in Signifyd’s Ecommerce Fraud Index, the Risk & Reward report says that account takeover fraud in the jewelry and luxury watch sector rose to 1.74 percent from .46 percent between 2016 and 2017. The percentage is calculated by looking at the total number of orders rejected due to the suspicion of fraud and the total number of fraudulent chargebacks. That sum is represented as a percentage of total orders received. And while the surge in account takeover is disturbing — and a trend seen across ecommerce — total fraud in the sector actually dropped between 2016 and 2017, according to the Risk & Reward report, which offers additional details on the changes in fraud patterns.